We’ve tried several subscription boxes, but Terra Create is BY FAR the best one! Every single kit has been filled with super high quality materials, and has been really fun! All three of my kids enjoy them, from my 8 year old to my 14 year old! The instructions are clear, easy to follow, and include extra educational information we all learn from! The finished products are beautiful, useful, and fit in with our natural/environmentally friendly lifestyle. Not a single complaint about this box, it has been exactly what we hoped for! Very thoughtful and engaging Art! My daughters, age 8 and 5, have loved every one of their TerraCrate boxes. The 5 yr old needed some help from her sister and more supervision, but they have both spent multiple hours on each box. The candle box was shared with our 12 year old niece and was a perfect gift. The supplies are always high quality with amazing directions that my 8 year old can read and follow. She loves the independence of creating something so high quality on her own. A wonderful gift. Thank you! BEAUTIFUL & worth every penny! I ordered a box subscription for 2 so both by children could enjoy arts and crafts together and not only was there enough supplies for both of them our entire family was able to enjoy making such beautiful dream catchers together and the materials sent were of highest quality and worth the cost. I have ordered at least two other craft boxes for the kids and canceled due to cheep supplies or lack of supplies but I plan to keep this box subscription coming as I was extremely happy with how everything was packaged and the amount and quality of supplies. Thanks for bringing our entire family together for some quality craft time. We are excited and awaiting this months box and can't wait to see what beautiful arts and crafts we get to enjoy. 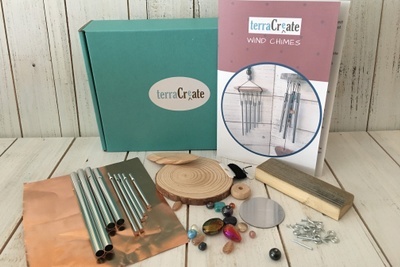 The Terra Crate was a big hit with my 12-year old grand-daughter who is at that awkward age between childhood and adolescence. The spooky zen garden felt both grown-up and playful at the same time - a perfect happy medium. She loved the project, and I was impressed by the careful attention to detail, quality supplies, and pretty packaging. We look forward to future shipments!